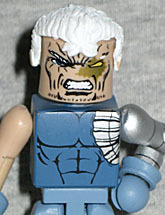 A battle-hardened soldier from the future, Cable initially led the New Mutants against Stryfe and his Mutant Liberation Front before forming the first X-Force team. His telekinetic and telepathic abilities made him a formidable opponent; though he often let his high-tech armaments do the talking. This figure is officially known as "Retro X-Force Cable," but it would be more accurate to call it "Greg Capullo Cable," because I know my Cables and he was the first one to start drawing the shoulder pads this way - almost like real physical objects, rather than shapes that hovered near his torso. This is an example of a time that sculpted pieces are better than paint: Cable's detail is so stupidly complex (by design) that molding it all helps draw attention to the dumb. 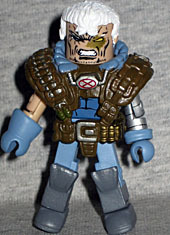 Cable has an angry look on his face, befitting the character and the style at the time. He has a golden flash painted around his left eye, but it's not centered properly - it sits lower than the eye does. If you remove his giant shoulderpads, you get a more "civilian" style Cable, with a simple blue shirt. The shirt is either cut away over his chest, or his techno-organic virus has started growing over his clothes, because half his pec is silver. His right hand is a full glove, while his left is a standard Minimate hand with a cuff above it. 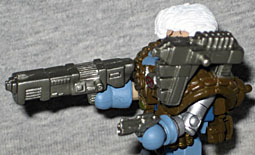 In the traditional manner, Cable comes with a lot of guns. There's a silver version of the Battle Beasts gun, a BSG pistol, and Punisher's knife. There's also a new gun, a big blocky piece that totally looks like the kind of thing Cable would use. All the weapons can be stored on the back of the pads, and there's a notch on the top of the left shoulder where one of the rifles can plug in. Created in a secret government laboratory, X-23 is the result of attempts to clone the savage Wolverine utilizing only his X chromosome. With years of training as an assassin and Adamantium claws of her own, X-23 is a lethal and often brutal member of the secret X-Force team. 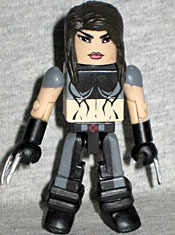 This was the second Modern X-Force Minimate, after Wolverine but before Warpath. She's dressed in the team's black and grey, and has the same "leg rings" that Wolverine had to form his boots, though Logan didn't have a bare midriff... FOR SOME REASON. Her hair comes from BSG Athena, and while the design is right, it keeps her head from moving. X-23 has clawed and unclawed hands, but no claws for her feet. Just like Tarantula. Surprisingly, her claws aren't just the normal Wolverine hands with the center claw cut off; instead, they're the Daken hands with the dumbass under-claw cut off. God, is Daken stupid! You get your choice of heads with X-23: masked or unmasked. Why not print both on one head? This set is a weird mix of retro and modern X-Forces, but it makes sense in a way. What doesn't make sense is that an old Cable no one would care about is so much better than a new character who hasn't gotten a Minimate before. I read somewhere that DST stays away generally from 2 decos on a head because the failure rate at the factory is higher on those due to the increased complexity, and these failures waste 2 decos rather than 1. I'm not positive but I think that the rifle originated here and got swiped by the Battle Beast.